Point University was founded in 1937 as Atlanta Christian College; it's a private, four-year liberal arts institution, which is on the leading edge of Christian education. From US Highway 17, Littleneck Road, Al Henderson Blvd. First Building on the right. From I-95; exit 94 to 204; turn at light at Cracker Barrel to Al Henderson Blvd. 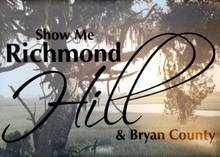 © Copyright 2019 Richmond Hill Bryan County Chamber of Commerce. All Rights Reserved. Site provided by GrowthZone - powered by ChamberMaster software.